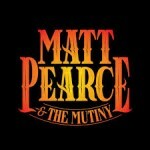 Share the post "Album review: MATT PEARCE AND THE MUTINY – Gotta Get Home"
Voodoo Six axeman, Matt Pearce releases his first solo project with his band The Mutiny, consisting of Joe Lazarus (Voodoo Six, on drums), Jon Moody (keys), Kez Gunes (bass), and the wonderful female vocalist, Acantha Lang. Produced by Tony Newton (Book of Souls Live), Gotta Get Home treads a fairly well-worn path in the blues/rock/funk genre but stands shoulder-to-shoulder with some of the best out there. With quite a history for one so young, Pearce kicked off his career with The Tracie Hunter Band, played with (now) Judas Priest fret-man Ritchie Faulkner in Metalworks, achieved notoriety and released five albums to-date with Voodoo Six, toured the world with Iron Maiden, UFO and The Winery Dogs and when he’s not goofing off doing all that (!! ), he recreates the guitar works of Lindsey Buckingham and Mike Campbell respectively in a Fleetwood Mac/Tom Petty tribute show……jeez, I need a nap now having only written one paragraph about Pearce’s endeavours. Turns out that (Marshall) stacks of experience and being instilled with a sponge-like musical soul mean that quantity and quality can happily co-exist in Matt Pearce’s universe. Wearing his Prince, Stones and Crowes influences as overtly as Superman’s underpants, Pearce deserves truckloads of kudos for this funking excellent album. On Gotta Get Home, Pearce and his cohorts interweave all the essential elements of rock, blues, soul and funk into an album of classy cuts. Out of the traps like a reborn SRV, album opener “Scarecrowing” is a real statement of intent that this ain’t no sidewalk sissy music – a sentiment which continues on “Ordinary Blues” (a tongue-in-cheek title maybe since “ordinary” is about the last word you’d use to describe this jammy funk-out). There are SRV/Richie Kotzen grooves and licks all over this album – witness “Like A Hammer” – but it’s one thing to copy your influences and quite another to write memorable songs loosely in the style of….Pearce can do that in spades – a tad moody and reflective on “Some People” and more out and out funkadelic on “Dig Deeper”. So far, so very good – then the whole thing steps up a notch with arguably the album’s two killer cuts. “Set Me Free” has the band in full force – if Joe Bonamassa did this one, you’d be all googley-eared. Title track “Gotta Get Home” opens with a mean and lush slide guitar before evolving into a gospel-infused Crowes-style epic, hands-down the track of the album with Acantha Lang giving it some serious lung-busting vocalizing – think Lisa Fischer on Gimme Shelter. Brilliant stuff. Pearce and the Mutiny change up the pace on “Worried”, more stripped back and almost unplugged but no less satisfying. Mid-paced, bluesy rocker “Who Do You Think You Are” closes the album with a punchy flourish. This entry was posted in ALBUM REVIEWS, ALBUM REVIEWS (Mobile), All Posts, Radio interview and tagged album, blues, funk, Gotta Get Home, guitarist, Matt Pearce and the Mutiny, review, rock, Solo, Tracie Hunter Band, Voodoo Six. Bookmark the permalink.